I operated the FT-817 with an OCF dipole. Only one QSO on 40 meters. Good band conditions. I worked 2 DX stations: UA9FGJ and DL2HWI. Worked NK6A in California. Sorry the participation is down. Thanks to all for the QSOs. Too much static to copy. Sorry to the stations that called me but S9 plus static. Was fun while it lasted. FT-817 to G5RVjr from rural PA.Nice to hear good signals on 20 meters, but the band emptied out fast. 40 Meters was noisy here so pulled the big switch early, but had fun. WB4MNK and W3KC had the big signals here. Many thanks to those whose efforts make this fun possible. Hope to ‘hear” you all next month. 20M was very good, but too little activity. 15 QSOs on 20M. 40M was fair with QRN and too little activity. 19 QSOs on 40. 80M had strong signals from K4ORD and AB9CA. No other sprinters heard on 80M. Hope to work you all and others next month. I used my AT Sprint 3 and Whiterook MK-44 paddles supplied with a 9.6v wall wart. All but one of my Qs was on 20m. The QRN on 40m was deafening. Will submit my log to the ARRL's Logbook of the World. I expect to use this same setup (except with batteries instead of the wall wart) in the FoBB, along with a 15m MFJ Cub. Hope to hear many of you on the air in it, too. XYL and I came up to cabin on Cumberland Plateau in part to escape heat at home QTH in MS. Unfortunately, it has been hotter up here! Rig was K1 at 5W to cfz. Band was noisy from local T-storms, but cloud cover cooled the shack a bit. Interesting Sprint! Rig was the usual K2 at 5w to 100' wire. Condx seems to be pretty good except for some QSB and QRN, but neither was too bad. 80 was fairly quiet (you know, for 80) but no one home! Activity was spread out with 20 Qs on 20 and 19 on 40. Only 2 on 80. Best DX was K2ZU in WA on 20. Also worked N6GA (20m), NK6A (40m), and K6CSL (20m) in CA. Best DX to the NE was, I think, NH. A good evening but we could always use more participation. Never too many! Thanks to everyone who stopped by and we look forward to hearing you again next month! 5W, inverted V fan dipole at 50'. Got to the party late, with only 25 minutes remaining. 20m was open to the south and nothing heard on 80m. Thanks again and see you next time. The backup rig - my HEAVY ATS-3 - continues to perform quite well with three LiPo batteries, providing 5W out and a final total of 14 QSOs. Conditions were very good on 20M, but I had to move to 40M after an hour since everyone I could hear, I had worked! I was using my backyard vertical. The vast majority of my contacts were on 20M this month, and the noise level was minimal. It wasn't even bad on 40M. I did not use this rig on Field Day, but stuck with the FT-847 we had for satellite contacts. It was easy enough to just turn the power down to 5W, so the Altoids box ATS-3 stayed in the car. Activity seemed down from June - possibly due to the lingering effects of the powerful and widespread Derecho. But I did make some contacts on three bands (20, 40, and 80 m). Thanks to all the ops who made it fun. The qrn was bad again, but sure glad it was low at Field Day which made for more pleasant operating. 16 QSOs on 40M, 8 on 20M , 3 on 80M. Seem to have about ran out of contacts in last 45 minutes. Thanks to all. K1 running 5W to a mini-beam at 25 ft for 20 meters and an inverted v at 40 ft for 40 meters. Made 11 Qs on 20 and 11 on 40. Worked K4ORD, K4BAI, and AB9CA on both bands. Worked 3 other NY stations on 40 ... cool. There was one station calling on 40 that I just couldn't copy...QRN and QSB...hopefully, next month we'll make it. Good participation again this month. I've uploaded my log to LoTW and eQSL ... hope you'll consider doing the same. Looking forward to the Flight of the Bumblebees on July 29 and to next month's sprint! Thanks to all of the participants and thanks to the organizers. K3/10 @ 5W to a 40m extended double Zepp or a 20m wire delta loop. 18 states with best DX N1WPU (ME) and closest W5ACM, 180 miles away in Houston. Tried 15 and 80m with zero luck. Signals on 40m seemed weak - even usually strong K4BAI was only 449 here in the Texas hill country. My thanks to all. Had fun. My first Sprint in several years. Operated from our lake house deck with a little QRM from some pre-4th fireworks. Answered SM7ZDI's CQ 4 minutes before the start so I had high hopes. Unfortunately either conditions were extremely poor or we had low activity (or both). A few good signals from TX and CA on 20m and NY on 40m but most CQs went unanswered. Oh well it was still fun to fire up my ATS-3 using a new 1200 mHh LiPo battery, running nearly 4 Watts to an EndFedz 10-40 hanging in a pine tree next to the deck. I may be back again if we happen to be at our lake house on a Sprint date. Thanks to all for your GREAT ears! For enlarged view, please click on the Scoreboard image. This was a lot of fun. K1 running 5W to a mini-beam at 25 ft for 20 meters and an inverted vee at 40 ft for 40 meters. Made 14 Q's on 20 and 15 on 40. I thought the participation was excellent this month...but always could use more...great to hear so many QRPers during the sprint. The first hour and a half flew by, then things quieted down. Never went to 80 and only made a few contacts during the last half hour on 40. Worked W5ACM on the second band with just a few minutes to spare. AA4GA and N4KV also made it into my log on 2 bands. All in all, a very enjoyable sprint. 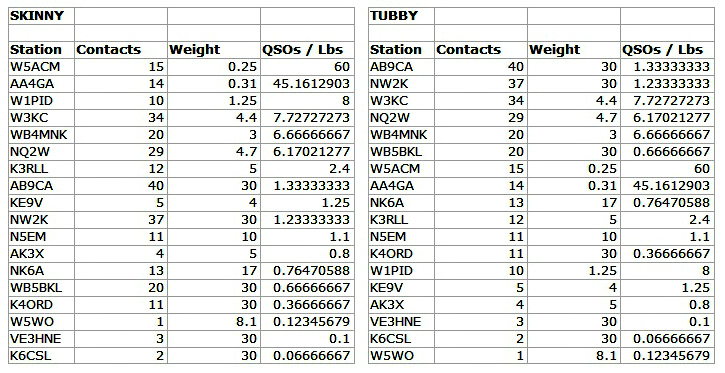 I've uploaded my log to LoTW and eQSL...hope you'll consider doing the same. Looking forward to next month! Thanks to all of the participants and thanks to the organizers. I ran the HB-1B into an OCF dipole. Best DX was W7OM in Washington. Not much activity. Only 4 Qs on 20M. 4 Qs on 40M and 2 on 80M. Stations on 40 were REALLY strong. Worked WB4MNK in FL on 40. One minute before the start (0059Z) I worked UN7PL in the Ukraine on 20M and I was hoping for lots of contacts. Thanks, all. Had a ball using the little KX1. Thanks to all who let me work them. See everyone next month. Up north for the summer and what a difference with an outside antenna! FT-817 to G5RV at 40’. Nice to work familiar calls and a few new ones tonight. Conditions seemed good and I didn’t miss the digi-QRM one bit. 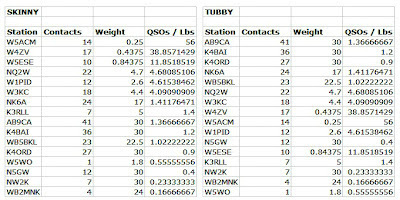 I got a 40 minute late start, but the bands seemed much better than last month...I kept dozing off in the chair and ended up only working about 45 minutes of the Sprint, but still managed to get within 2 QSOs of last month - probably could have had a pretty good total if I'd started on time and worked the full two hours! ATS-3b at 2w out to an 80m doublet up 45' or so on 20m and 40m only this time around. Thanks all - see you next time! Very good conditions. FT817 - 5 Watts - R7 Vertical plus Dipole at 20 ft. on 40. I started this eveninng on 10m with no joy. Same on 15m. I moved to 20m at 01:30UTC and soon after worked NW2K in NY. Band conditions were not very good. Very noisy this evening. I moved to 40m at 02:00UTC. I called CQ and tried to call several stations. 40m was also very noisy this evening. Bill, W6QR, near Los Angeles, CA returned my call at 02:55Z. He was QRO 100 Watts and gave me a 329 report. I hope next months Spartan Sprint will be a little better. Rig: IC-703 at 5w;Antenna: Sloping ZS6BKW doublet (24 ft at high end); 6 Qs on 20; 23 Qs on 40; 5 Qs on 80. Band condx: Lots of atmospheric QRN. First SP in quite a while - fun as always. Another good sprint. Activity seemed a bit higher. Rig was K2 at 5w to one of two wires. 20m was the money band this evening. 32 contacts there including a short chat with Rumi in Bulgaria. Also had 8 Qs on 40m. The prop on 20 was somewhat flaky. Some QSB but not as bad as it is sometimes. 40 was noisy and also appeared to be in not so good shape. The few contacts there were tough. Also called on 15 and 80 but netted nothing from either. 20 was open to TN, VA, and FL as well as WA, NY, and ME. The few on 40 were fairly close by. Did not work anyone from GA which is unusual, although did hear N7KDL in LA. As usual it was an interesting and enjoyable evening. Thanks to all who called and to the organizers who do the real work. See ya' next month. 5W, inverted V fan dipole at 50'. 9 QSOs on 20M, 24 on 40M (all around 7040), and 4 on 80M with storms in the area. Operated for the first 75 minutes. Thanks! 40 and 20 weren't in great shape but I managed to work a few Spartan Sprinters. After 10pm (local) I switched to 80 and never heard a single CQ SS. Had fun despite the light participation. Anxious to see the other results. See you all next month! The backup rig – my HEAVY ATS-3 continues to perform quite well with three LiPo batteries, providing 5W out. Conditions were very good to the east on 20M, but the Western stations and Midwest stations could not hear me. It was good to work stations in NH and NY though. I was using my backyard vertical. The same was true for 40M, but with a higher noise level. 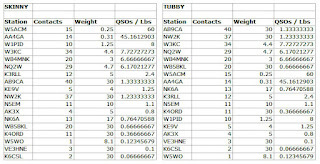 The total QSO count was split almost evenly with seven on 20M and eight on 40M. I might even use this rig on Field Day if I can get a bit better with the homebrew keyer paddle. It is constructed from a few old relay parts. Lousy conditions here on all bands. 20 did not play out like I thought. Finally gave up after 45 minutes of noise. Did make it into NH, NY and ONT. Good ears guys. I was only on for the last hour, on 20M worked GA, AL, KP4, DL, LZ on 80M only 1 qso and on 40M made 5. Activity was way down this month, hope it is better next month. I have dabbled in the SP several times but this is first log submission. I only operated for 11 minutes during the sprint due to other obligations, but 40M seemed good and I managed 4 contacts. Thanks to WB4MNK for his patience in pulling me out of the QRN. Stuck to 40M using a DSW-40, battery powered. Hope to get more time next month. K3/10 @ 5W to a 40m extended double Zepp or a 20m delta loop. Back after a three month absence (forgetfulness, vacation, T-storms). Most of my QSOs were on 20m and during the first hour. Tried 15m with no luck. Got 16 states along with both coasts. My thanks and regards to all. Had fun.